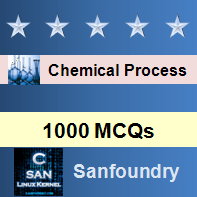 This set of Chemical Process Calculation Multiple Choice Questions & Answers (MCQs) focuses on “Internal Energy”. 1. _________ represents a microscopic account of all the molecular, atomic, and subatomic energies. Explanation: Internal energy represents a microscopic account of all the molecular, atomic, and subatomic energies. Explanation: Specific internal energy is a state variable. 3. Specific internal energy _________ stored. Explanation: Specific internal energy can be stored. Explanation: Cv is the change in internal energy at constant Volume. 6. Absolute values of internal energies ________ calculated. Explanation: Internal energies can be calculated relative to a reference state. 7. What is the change in internal energy when 10 kg mol of Oxygen is heated from 200 K to 400 K at constant volume (Cv = 4000 J/(Degree Celsius)(Kg.mole))? Explanation: U2 – U1 = n*Cv*(T2-T1). 8. Which one is true for internal energy? Explanation: All are correct for internal energy and are part of its property. Explanation: Internal energy does not depend on path. 10. A mass of 20 Kg mol is cooled from 200 K to 100 K and the change in internal energy is 400 KJ. What is the heat capacity at constant volume?